Markenfield Hall, south of Ripon, reputably the oldest, complete moated house in the country, opens up to the public under the Historic Houses scheme for a few days a year. I visited the place for one of their “Mop-Up Monday” tours, arranged to cope with the growing flood of interested visitors. Only the name on a gate-post hints at the Hall’s existence: a tight turn takes the car on to a long track which runs through fields for almost a mile before the present Hall and its cluster of farm barns and buildings appears. The Markenfield estate borders the Fountains Abbey lands and the Hall, built in 1310, situated close to the mediaeval Ripley to Ripon Road. Back then, any passing traveller would be aware of the Hall’s imposing presence while those within had early warning of interesting people or troublesome groups using that stretch of road. The builder was John De Markenfield, Canon of Ripon Cathedral. He was also Chancellor to King Edward II, who granted John permission to crenellate and fortify the walls as defence against powerful Northern barons and marauding Scots. On the outer wall of original hall, one can see where the stone staircase once led up to the living quarters on the first floor of the square tower, providing more safety. Not only did the Markenfields defend themselves well: they married well and wealthily, adding the coats of arms of several heiresses to the outer south wall of the great kitchen block. However, on that fine autumn morning of my visit, the setting seemed idyllic and peaceful. 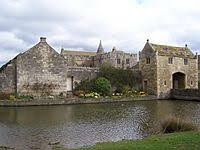 We gathered in the car-park beside the impressive Victorian farm buildings, admiring the pair of black swans and the ducklings on the moat, before being led across the wooden drawbridge and through the Tudor gatehouse. Through the kitchen we went and up to the lofty Great Hall, scented with wood-smoke, and which contained sofas and tables stacked with relevant books and histories, as well as several objects and portraits relating to the family. Generation by generation, the Markenfields had risen, surviving Lancastrian and Yorkist loyalties and fighting for the King at Agincourt, Flodden Field and other battles. However, it was in the Chapel of St Michael the Archangel, a space so small we could only crowd in twelve at a time, that one saw the emblem of their downfall. The Markenfields were once a fiercely Catholic household and masses had been said in this chapel for over two and a half centuries. Signs of faith are set into the walls there. Beside the altar is a double piscina, a kind of basin used by priests for ceremonially washing vessels after communion. A squint is cut through the corner-stones of another wall so that daily mass could be observed from the lord’s private chamber. Then, on the far wall, hangs particularly doleful treasure : a scarlet banner embroidered in gold with the Five Wounds of Christ, which was once a famous devotional image, especially in the strongly Catholic North of England. The deeply revered standard is rather luridly decorated with a sacred heart and chalice, the wounded hands and feet of Christ and a crown of thorns, and it testifies to the family’s faith and their role during two rebellions against the Crown, and to the loss of Markenfield itself. 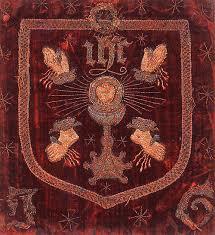 The first, The Pilgrimage of Grace, was in 1536. This rebellion was led by Robert Aske, brother-in law to the Sir Thomas Markenfield of the time. 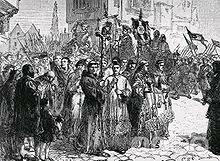 The Northern lords and people rose against Henry VIII, petitioning him to halt the Dissolution of the Monasteries and raising other grievances. Henry and his Commissioners appeared to be deliberating: a long game which weakened the rebel’s hands and which finally led to the fierce suppression of Fountains Abbey and other religious establishments in 1539. Robert Aske was executed on Clifford’s Tower in York, but Sir Thomas and his family survived, at least for a generation. Then came the second rebellion - The Rising of the North - led by the first Sir Thomas’s son Thomas. Richard Norton of Norton Conyers, his uncle, was standard bearer, charged with carrying the famous and gory banner. 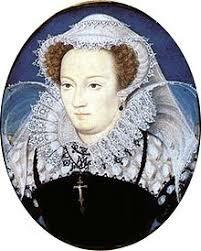 On 20th November 1569, a host of rebels gathered in the courtyard of Markenfield Hall itself. After hearing Mass in the chapel, the leaders set out on their mission. Their plan was to remove Queen Elizabeth – the "illegitimate heir" – and replace her with Mary Queen of Scots who would restore the practice of the Catholic faith. Defeated by the Queen’s troops, most of the rebels were killed or executed. Thomas and Richard fled the country and died in poverty. Markenfield, both house and estate, were confiscated for High Treason. The Hall passed out of the family and into other hands, becoming an insignificant tenanted farmhouse with absentee landlords. In 1777, the turnpike and new toll road (now the A61) shifted all passing traffic a mile further away and Markenfield Hall disappeared from public life. However, this very neglect and insignificant income meant that the property was not improved, the great hall was largely unaltered, the moat left un-drained and all the original features unchanged. The Chapel too, feels peaceful in its restoration, with a rare portrait of Sir Richard Norton now looking down from the wooden panelling, and candles lit below the small array of icons in a devotional alcove. Services and masses are sometimes held here and each August, a Tridentine Requiem Mass is said in commemoration of Sir Thomas Markenfield and three other members of the family – Anne, Isabel and Elizabeth – who were all witnesses to the passions and suffering aroused by that sacred scarlet banner and the Five Wounds. The Chapel of St Michael was also used for the wedding of the writer Ian Curteis and Lady Deidre Curteis, widow of the seventh Lord Grantley – a Protestant and a Catholic - who have made Markenfield Hall their home. P.S. After my visit to Markenfield, I bought myself a replacement copy of H.F.M. Prescott’s 1952 work, THE MAN ON A DONKEY, her wonderful novel about the Pilgrimage of Grace that first introduced me to the history of Yorkshire and the North several years ago. This copy will not be borrowed! I enjoyed this - and thanks for the book tip! If anyone can't get as far north as Markenfield, there's also Stokesey Castle on the borders of Wales, near Ludlow. 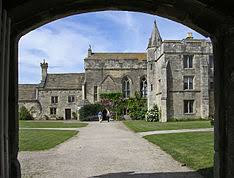 It was built in the 13th Century and still has its great hall, wall and defensive tower. The moat's dried up, though. I was reminded of it by your account of Markenfield because Stokesay survived for much the same reason - it was abandoned, forgotten and used for centuries as a byre. Only in the 19th Century did a keen historian recognise what it was. The wedding of a Protestant and a Catholic - that is good to read after all the horror. Looks like an amazing place to visit - thanks, Penny! I'd never heard of Markenfield before. These old houses are so good at making history come alive. Hello Penny - Markenfield calling! Thank you so much for a wonderful write-up and lovely comments. I think we may have spoken at the desk after the tour - if we did then it was lovely to meet you.